Enterprise organizations, in many ways, are trend-setters, innovation drivers, and the organizations that others look to for blueprints on how to grow, evolve and achieve success. But it’s not always easy to scale your organization for continued growth to meet market and customer demands. One area of enterprise organizations that is particularly challenging to scale, and oftentimes is an afterthought, is recruitment. Why is that? Even the best, most innovative strategy and plans for growth are nothing without the people to execute them – so why don’t organizations tackle recruitment with the same appetite for efficiency, effectiveness, and outcomes as they do, say, product development, or sales, or operations? To start, enterprise recruitment is hard. The labor market has shrunk to a historic low, job seekers are more informed and more selective about their job prospects, and the recruiting industry is evolving and changing at an increasing pace. So not only is enterprise recruitment under ‘duress’ from external factors, but due to internal factors, it can be very complex. Below we outline five reasons why recruitment teams at enterprise organizations have their work cut out for them, and how they can alleviate these challenges with programmatic recruitment technology to better keep pace with hiring needs and shifting market conditions. Historically low unemployment ignites competition for talent in a couple of ways. First, we know that unemployment and job seeker behavior are closely tied. In a recent Appcast research report, when looking at the apply rates across all 50 US states, we determined that where unemployment was low, so too were apply rates. In other words, it is more difficult to find, attract, and convert job seekers in markets where there are fewer people without jobs. Makes sense, right? The inverse also holds true – where unemployment is high, there are clearly more people actively seeking jobs and therefore apply rates are higher in those areas.Think in terms of real examples – it is more difficult to hire for certain roles in North Dakota, than in New York City. So how does this tie back to enterprise recruiting? Well, enterprise companies hire across the US, so certainly in larger, booming city centers, this information is helpful and even beneficial. But they also hire in more difficult regions, where competition is a bit tighter, so it becomes more difficult to fill open roles in those areas. This brings me to a second point – even in those areas where unemployment is higher and apply rates are up, you are often competing with other enterprise organizations, some of which are well-recognized, known brands. So you are vying for job seeker attention with some pretty tough competitors, especially if you haven’t spent time investing in your employer brand and employer value props. All things being equal, why should a job seeker choose your company over the one they already know and recognize, and have an understanding of their brand and culture? When you already are big, you hire big. There’s no simpler way to say it. You have numerous departments who all have strategic, operational and tactical goals to achieve, and one of the main ways you fuel company growth is by growing your headcount. When it comes to recruitment, this makes for a complex, high-demand, fast moving target! Enterprise recruiters need to find, engage, attract, convert, and screen thousands of candidates for hundreds, if not thousands, of open positions (hence, the high volume recruitment). So where do they begin? To be fair, this is a challenge that impacts many facets of an enterprise organization and, more importantly, the key point is that it’s actually the lack of integration between these systems that hurt the most. Wouldn’t it be nice if all of our tools and software interacted the way that you do with your co-workers? They problem solve, they find a common language to speak, they work together to achieve goals, etcetera, etcetera… but unfortunately, this is not (yet) reality. So why is this a challenge? It’s actually more of a barrier because technology (a.k.a. systems) is one of the biggest keys to scaling a recruitment operation; but of course, implementing and integrating those technologies isn’t always a simple process and has to take many stakeholders’ (in this case, hiring managers and talent acquisition decision makers) needs into account. Furthermore, many recruiters are approaching sourcing in one of two ways – they’re either banking on the ‘usual suspects’ (think Indeed, ZipRecruiter, Monster, etc.) to drive candidates in their pipeline or, they may be trying to magically find that perfect mix of sources, the sweet spot, that will deliver them the right mix of candidates, that hiring managers won’t reject, for a reasonable cost, and for all of their open roles. Rather scientific, huh? Even if either of these approaches work (most times they don’t – money is wasted, roles remain open, hiring managers grow impatient), they are a pain in the back to operate. You have to manage vendor contracts, for which you are typically locked into for at least a year, and you get no control and no insight into how your budget is being spent or where your candidates are actually coming from. Therefore, it becomes extremely difficult to make informed (even data-driven) decisions about how to get better results. Even though the previous point paints a gloomy picture, the reality of enterprise organizations is that in order to evolve and grow with (or ahead of) the markets in which they operate, they still need to proceed with exploring, testing, and implementing new software and technologies. This is why many of these companies are on the ‘leading edge’ in their respective industries and niches. However, as with any change in an organization, it needs to be managed, particularly in a large organization. Think about these two scenarios: At Startup ABC, Joe wants to implement software to better manage customer engagements. So, he consults with his executive sponsor (or maybe he is the executive sponsor), negotiates a contract, and works with maybe one other team member to implement and roll-out the new software. If Joe worked at Enterprise ABC, he would need to strike up a cross-functional taskforce to identify needs, evaluate options, develop a communications plan, address risk management, consult with IT, undergo various layers of contract negotiation and so on an so forth. Enterprise organizations are complex! When it comes to change management, there are two sides to the coin – those who manage change poorly (with obvious consequences) and those who do it well. But even when you do it well, that doesn’t mean it’s easy! Change management involves careful planning, constant communication, executive buy-in, expert employee engagement, and time – lots and lots of time. Ultimately, this slows down scalability and tacks on time to your already tapped time-to-fill, which doesn’t help your ability to attract and engage candidates, particularly when we know that the sooner you reach candidates (for instance, before your competitors), the more likely they are to convert to a hire. Let me start by saying: decentralized recruitment is not wrong or in any way less than centralized recruitment. Both structures have their benefits and are suited to different organizations for different reasons. What is important to note here, however, is that organizations who are faced with the challenges born out of a decentralized recruitment operation can leverage the benefits of a centralized recruitment operation through the use of programmatic technology. But first, what is challenging about decentralized enterprise recruitment? So How Does Programmatic Technology Help? First off, what is programmatic? Programmatic is simply the use of software and data to automate tasks, particularly on a large scale, that functions more quickly and efficiently than a human executing those same tasks. In the context of recruitment, and even more so of recruitment advertising, it is the buying, placement, and optimization of (job or employer brand) ads performed by software, rather than people. It allows advertisers to target their ideal demographic across the web, and keeps them from overspending on clicks that don’t convert with automated bidding processes. 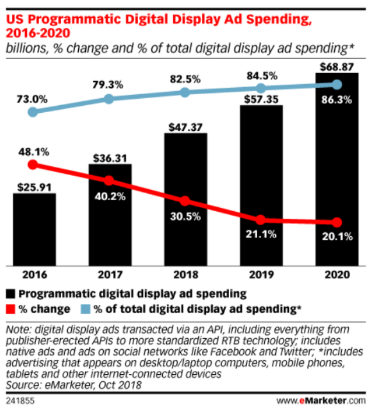 Programmatic gathers browsing data and uses complex algorithms to show people the right ads, at the right time, in the right place, based on their likelihood to engage with the advertisement. 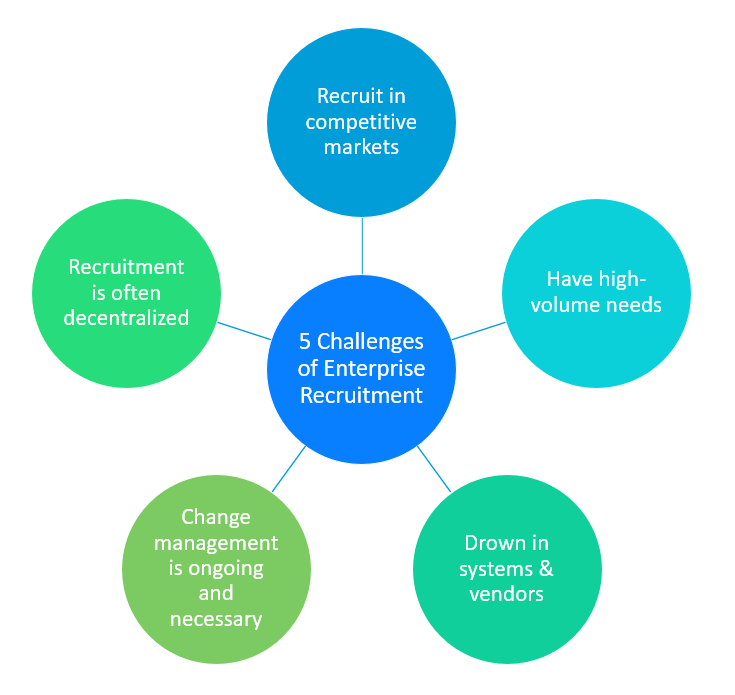 How does this help us address our five challenges of enterprise recruiting? Recruiting in competitive markets → As discussed above, this challenge has two facets but programmatic technology can help with both. In dealing with competition regions and markets, programmatic gives you the flexibility to target specific locations with specific bids and strategies; it knows where higher bids may be necessary to get more volume or better quality. Similarly, it’s data insights give you the ability to know where you could be saving money (in other words, bidding less) because you don’t need to bid as high if the market isn’t as competitive or the role is less difficult to fill. Secondly, many enterprise organizations are investing a lot of resources in not only promoting their corporate brand, but also their employer brand, because it fuels their recruitment efforts and drives higher candidate engagement and attraction. Programmatic technology is used to place employer brand and recruitment ads in front of the people who need to see them, and it can also be used to retarget those candidates as they browse across the web. High-volume recruiting needs → One of the central benefits of using software and data (and algorithms!) is that the computing necessary to determine who, what, when, and where recruitment advertisements should happen can literally happen in the blink of an eye. Technology enables scalability. When you leverage data to make decisions on how to drive candidate volume, it can happen faster, with better quality, and less waste. 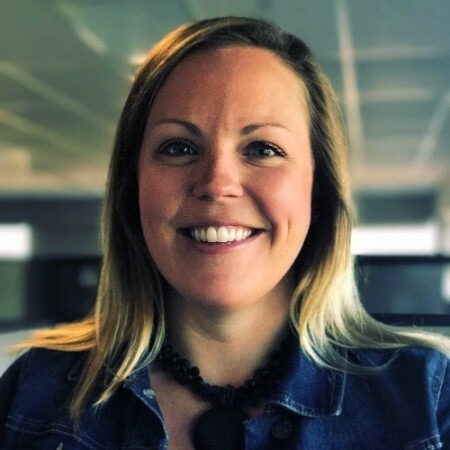 With programmatic, you can ‘turn off the faucet’ using rules to let the software know when you’ve got enough candidates for a given role, so that that extra budget can be reallocated to other jobs that need more attention. Multiply this process by the number of open roles you have to fill, the number of days you have to fill them, and the budget you have to accomplish this… and programmatic becomes invaluable. For more tips on high-volume recruiting, check out our recent ‘Do’s and Don’ts’! Overload of systems and vendors → Let me be clear: I am not about to tell you I have the ‘miracle cure’ for all of your integration woes. Sorry. What I will share, however, is that programmatic technology in many cases can facilitate a common language between your recruitment technology stack. When you use data, you also get data, meaning that programmatic gives you insights you can use to answer questions like: Is this vendor giving me the results I need? Is there a breakdown in my recruiting process? Are our pipeline metrics realistic? Is our apply process efficient and works well to convert candidates? Moreover, there are providers of programmatic recruitment advertising that allow you to simplify the management of your sources. What if you could manage all of your vendors (yes, even some of those ‘usual suspects’) through one tool, one dashboard, with a single language of communication? Imagine the time saved and ease of insight when everyone is on the same page. Change management → While implementing new technology is never a simple task, programmatic offers a number of outputs that can be useful. Primarily, it’s the data. Programmatic recruitment provides data that allow you to plan, project, and optimize spend and results. Talk about a great tool for establishing executive buy-in! It’s these types of KPIs, too, that reframe recruitment as a true strategic investment, rather than a cost center. Secondarily, programmatic provides scalability to your recruitment advertising – from facets of need identification and stakeholder engagement to managing to different hiring teams and goals. Optimizing the placement, purchase and performance of recruitment ads for hundreds or thousands of roles because much more simple when you are able to set guidelines for how and when money is spent (with the use of programmatic rules) and furthermore, be accountable for decisions made. Decentralized environments → As I mentioned above, there is nothing wrong with operating in a decentralized recruitment environment. However, as you’ve likely discovered from reading to this point, there are benefits that come from being centralized that can be leveraged through the use of programmatic technology and platforms. Scalability, and a holistic approach to bidding, budgeting and strategy are just a few but beyond that, this broader picture of planning, managing and optimizing recruitment eliminates waste and redundancies and provides greater accountability at all levels of recruitment and decision making. There have been many technological ‘fads’ over the years, maybe more so on the B2C side of things rather than B2B, but nonetheless, programmatic recruitment advertising is not one of them. As recruitment advertising and marketing continues to follow the path of consumer marketing in every way, the use of digital means to fuel advertising is projected to grow. As an enterprise recruiter, or recruitment or talent acquisition leader, it is imperative that you are taking steps necessary to make your recruitment operation as innovative and efficient as every other part of the organization. Remember, you are competing for today’s talent so adopting technologies that enable you to be better, faster and go further than your competitors will serve you well in helping to fill those open roles and grow your organization. For more tips on getting better performance from your recruitment advertising efforts, check out our whitepaper, The Guide to Performance Job Advertising.